The Wild Arms series of roleplaying games started out on the original Sony PlayStation, and for many years its claim to fame was the heavy Wild West influence on the setting, characters and plotlines of the game. The fourth installment, developed by Media Vision and released in the U.S. by Xseed Games in 2006, was a distinct departure from its predecessors, discarding the western vibe for more of a sci-fi setting and boasting a new battle system as well. The result is a game that feels unlike any other entry in the series, and thankfully, the changes wind up being all for the better. As the game opens, we are introduced to lead character Jude Maverick, who unknowingly lives in an isolated community high above the world of Filgaia. One day he notices a rip in the sky and sets off to investigate, only to discover a malevolent army and a kidnapped young girl named Yulie. Together, the two of them join forces with her kidnapper, a man named Arnaud who has experienced a change of heart, and the three of them try to put a stop to the army’s activities. In the process, Jude acquires a special weapon known as an ARM, and the trio eventually finds their way to the planet’s surface, where join with a skilled swordswoman, set off to find out why Yulie was kidnapped and thus get caught up in a struggle over the planet’s future. On the whole, the story is passable. It is entertaining without being overly original or spectacular, and thankfully the English localization of the text is much better than the effort shown in Wild Arms 2 & 3. The real highlight is the tale of the party’s fourth member, Raquel Applegate, who in a nice bit of role-reversal is the strongest member of the group. As it turns out, this 19-year-old also happens to be struggling with a fatal illness, and is determined to see as much of the world and enjoy as many experiences as possible before passing on. Eventually she falls in love with Arnaud, and the two of them try to find a way to cure her condition. It’s touching stuff from start to finish, and her story alone elevates Wild Arms 4 above average status. The characters are cel-shaded and are distinctly anime-style in design, which is pretty much standard fair for most Japanese-developed Playstation 2 RPGs, it seems. They are animated well, although folks who don’t like this particular style probably won’t appreciate the visuals in this game. Dungeon levels are well designed, as are the enemies you’ll fight during encounters. In terms of graphics, this is a solid effort. The game features a lot of voice acting as well, though sadly of rather spotty quality. Jude’s voice in particular gets rather annoying during the game. The music, again, is solid but not spectacular, save for the vocal tracks that play during both the opening cinema and, in a nice touch, during the final battle. Ultimately, all of the positives and negatives balance out in a solid three-star effort. For me, this is the real highlight of the game, for two main reasons. For one thing, the game features several enjoyable platform game style gameplay elements, including jumping, dodging lasers, and so forth. They are implemented quite well and nicely complement the traditional Wild Arms style of using items to solve different puzzles in dungeons and levels. The other primary reason is the overhauled combat system, which plays out like a faster-paced tactical RPG. Known as the HEX system, these battles feature seven hexagons, one in the center and six others surrounding in a circular patter. Players and enemies alike can move back and forth between the different hexes, and multiple characters can occupy a single space at any given time, with attacks, healing spells, etc. will affect everyone standing in the targeted space. It succeeds at being both fast-paced and strategic at the same time. 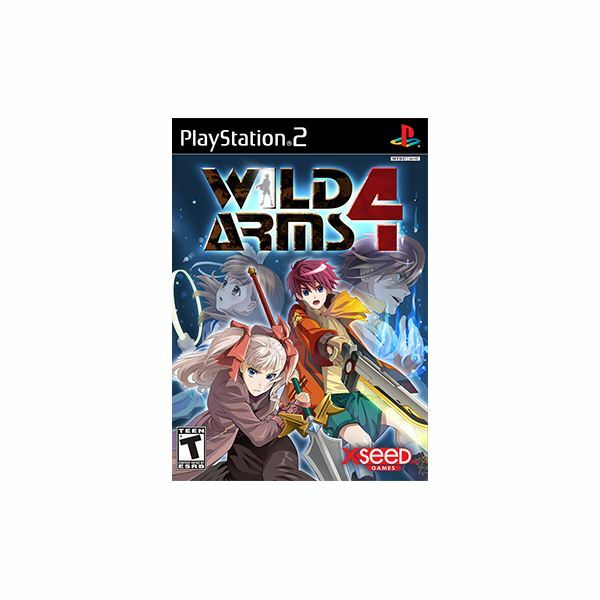 With solid traditional RPG elements supporting these two innovative systems, Wild Arms 4 winds up being a well crafted and surprisingly fun game to play. Wild Arms 4 caught me by surprise when I first played it back in 2006, and it remains one of my favorites today. As much as I love roleplaying games, often times it feels like work getting from one plot point to another, but not with this title. No, Wild Arms 4 succeeds at doing something few RPGs have — being fun to play. With the brilliant HEX combat system (which thankfully returned for the fifth game in the series) as well as the platforming elements, it is a pleasant change of pace from similar titles and is arguably the best game to date in the Wild Arms series. This woefully underrated roleplaying game is available for under $20 at most gaming retailers these days, and while it is on the short side, it is a thoroughly enjoyable title that is well worth that kind of bargain price.